For Azoth, survival is precarious. Something you never take for granted. As a guild rat, he's grown up in the slums, and learned to judge people quickly - and to take risks. Risks like apprenticing himself to Durzo Blint. The Way of Shadows reminded me quite a bit of Mistborn by Brandon Sanderson. They both contain engaging and morally conflicted protagonists who rise up from nothing to the strongest characters in the story. They each depict a society run rampant with the selfish and greedy decisions made by the upper class. And they each offer exciting epic long stories that allow the reader to familiarize themselves with the world in which these characters live and relate to the characters predicament however dissimilar it is to the readers situation. And it’s because of all these factors and more that make The Way of Shadows one of the best fantasy books, and Brent Weeks one of my favorite authors, I’ve read this year. 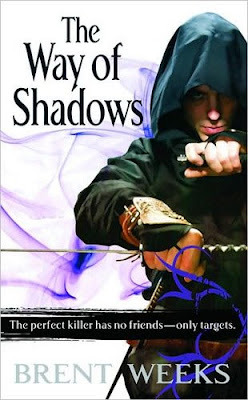 Of course The Way of Shadows isn’t just an exciting story filled with magic and death. Instead it is novel of epic proportions filled with engaging and endearing characters such as the street rat turned assassin Azoth/Kyler, Durzo, the killer with a conscience of sorts, and Momma K, the whore with a heart. Of course besides creating characters that will draw you into the story, Weeks has also created an intricate and captivating plot that is so engaging and seeped in mystery that readers wont even realize they have barely scratched the surface until the end of the first book. Making the second and third books a must read as well. All in all I was very impressed with The Way of Shadows, it’s not often that you’re able to find a book that is able to live up to expectations as high as Weeks has received, but The Way of Shadows really pulls it off. Making this fantastic series a must read book that you’ll want to have the sequels on hand when you start.